Nervous Senate Democrats raised concerns with Hillary Clinton during a private meeting in the Capitol Thursday over a recent poll showing Donald Trump leading or tied in several battleground states. 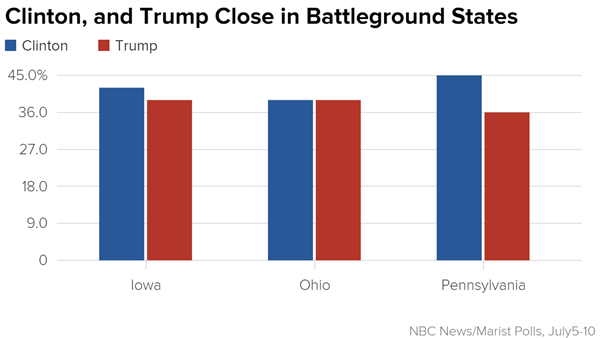 The same survey showed Trump ahead 2 points in Pennsylvania, another big swing state, and tied in Ohio. The three states have been pivotal in the last four presidential elections. But here’s the bad news for him: These polls — which mostly show Clinton either ahead or tied in these battlegrounds — were all taken during or after Clinton’s roughest week of the general election, with FBI Director James Comey’s rebuke over her emails. So you could view these battleground numbers as a floor for Clinton, while Trump is still unable to break 40% in many of these states. (Indeed, look at the high undecided numbers; voters moved away from Clinton, but they didn’t move toward Trump.) And what should ring alarm bells for the GOP is the polling in Colorado and Virginia, where Clinton is up in high single digits/double digits. On the eve of the major party conventions, voters are grudgingly rallying around the nominees while expressing broad misgivings about the candidates, the campaign and the direction of the country, according to the latest New York Times/CBS News Poll. More than a third of Republicans say they are disappointed or upset that Donald J. Trump, who crashed the party’s nominating process, will represent them in the fall campaign; an equal number say he does not represent the values the party should stand for. Democrats are only marginally happier with Hillary Clinton as their party’s candidate. A quarter of Democratic voters say they are disappointed in her as the nominee; an additional seven percent say they are upset. More promisingly for her, three-quarters say Mrs. Clinton stands for the core values and principles of the Democratic Party. The broad discontent is reflected in the head-to-head contest, which has Mr. Trump and Mrs. Clinton tied at 40 percent. Mr. Trump’s standing has held steady for weeks at around 40 percentage points, while Mrs. Clinton has polled in the mid-40s in most public surveys. While this could represent a floor for Clinton, it is possible that she could have further bad news. Possible additional problems related to the email scandal include investigations of perjury before Congress, which at very least will highlight how she has also been lying to the American people about the matter for over a year. Her dishonesty has become undeniable, despite the frequent efforts by her supporters, following the reports from the State Department Inspector General and the FBI. Clinton could also face problems with investigations of the Clinton Foundation. Because of concerns over conflicts of interest before Clinton was confirmed as Secretary of State, an agreement was reached in which Clinton agreed to disclose the identities of all donors to the Foundation while she was in office. Clinton failed to abide by this agreement. Clinton went on to unethically make decisions regarding parties which were making donations to the Foundation and making unprecedented payments for speeches to Bill Clinton, whose speaking fees jumped from 150,000 to typically 500,000, and as high as 750,000 when dealing with those with requests before Hillary. Clinton has avoided taking questions from the media on these topics, but she cannot hide from the press forever. She could suffer further in the polls if unable to handle questions on these manners. Plus there is also the risk that Clinton could fall further in the polls based upon bad news beyond the scandals, or if Trump starts spending more money and begins to campaign in a more effective manner. While odds still favor Clinton being elected, the Democratic Party is taking quite a risk in nominating a candidate with all her baggage. Of course it is still not too late for the party to nominate Bernie Sanders instead, with Sanders having none of this baggage, and having shown far larger leads over Trump than Clinton could achieve even before her fall in the polls.